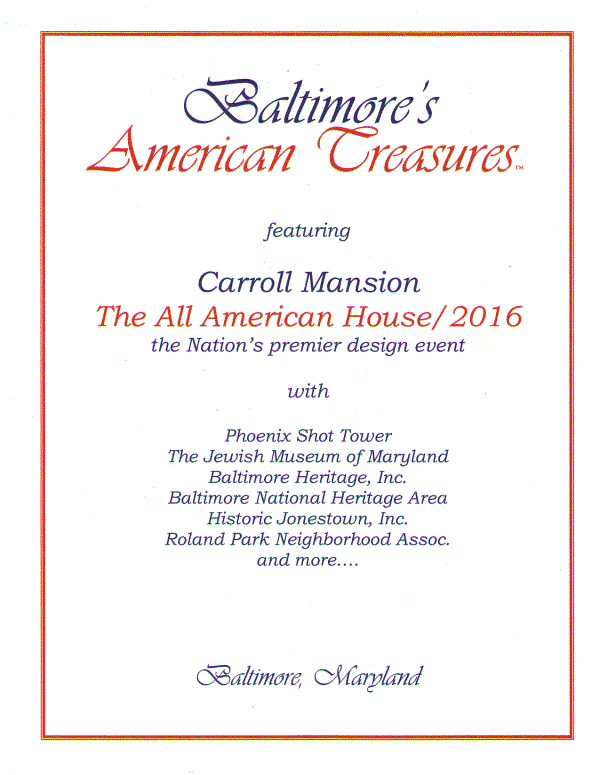 The Carroll Mansion has been selected as the Baltimore All American House of 2016 and will be the host of Baltimore’s American Treasures Event, taking place May 1 to July 10. This design event will showcase Baltimore’s design and cultural heritage, and the tour begins right next door! Student teams from area universities, including Johns Hopkins University Carey School of Business, The George Washington University Corcoran School of Art + Design, Morgan State University, Stevenson University and the Community College of Baltimore County, will be renovating the interior of the mansion. The rooms will be furnished by the students with products from American manufacturers, especially Maryland-based companies. Visitors will be able to begin their tours at the Carroll Mansion from May 1 to July 10. There will be 25 other Baltimore destinations on the tour that showcase the best of Baltimore’s design history. Visit for the calendar of events. We are very excited about this exhibit coming to Baltimore—especially with the host of the tours being the Carroll Mansion, our next door neighbor! The Carroll Mansion shares the same courtyard and we are proud to be so closely connected to our city’s history. Enjoy the beautifully landscaped courtyards and comfortable oasis right in Baltimore City. Come stay with us and enjoy American Treasures while only being a few steps from the action! Enjoy a delicious breakfast and then begin your day of exploration, history and design. We are also convenient to Little Italy, the Inner Harbor and Fells Point. Visit our website or call us at 410-385-1840 to reserve your room right in the heart of Baltimore history.